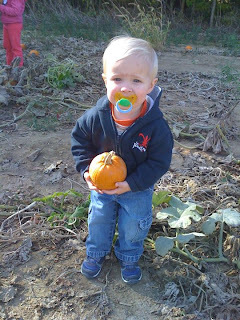 This past week Charlie & I joined Jack's preschool class on a field trip to the pumpkin patch. The kids learned about pumpkins, gourds & corn. They helped carve a big jack-o-lantern, tasted roasted pumpkin seeds, sipped cider & went on a hayride. My favorite part was the hayride. On the big wagon packed with straw, we crawled in for a tour of the farm. Jack & I happened to sit across from Jack's friend George & his mom. I have a soft spot for George. Last September George's dad Charley was killed in a bike accident. He was riding in a group of about 30 cyclists when a few at the front went down. It was a domino effect & Charley died a few days later from his injuries. He left behind a wife & two young boys. I often wonder how George's mom does it. This day was no exception. I caught myself looking across the wagon at her & wondering how she keeps it together so well. As the big tractor pulled our wagon out of the woods and toward the pumpkin patch, we came into a beautiful clearing. The sky was blue, the breeze was cool & the scenery was the perfect picture of autumn. George's mom smiled, tilted her head up to the sky & said to all of us "life is good". I was amazed. Such a simple, thankful statement from someone who has been through so much. She would have every right to feel cheated out of so much that life has to offer, but instead is grateful for what she has. I imagine it takes a lot of strength to hold your head up high after losing your spouse, the father of your children, let alone be thankful for what you see when you do. 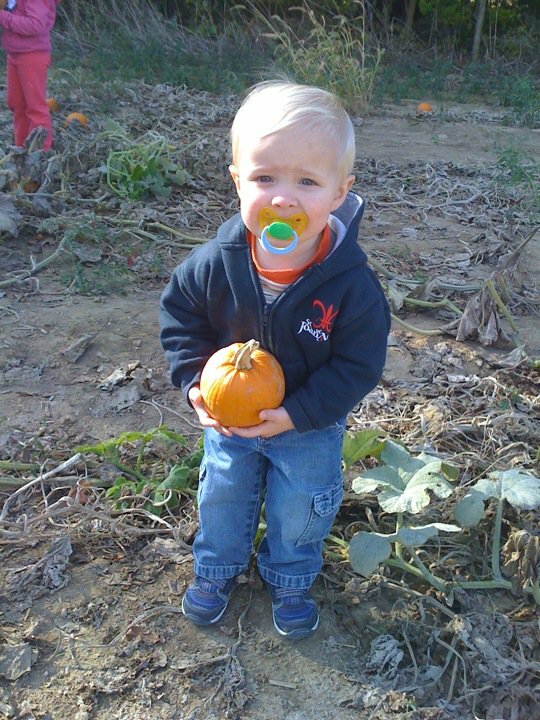 I left the pumpkin patch that morning counting my blessings. Sure my husband had just left on a long business trip with little time to even talk on the phone... but he was coming home. It was a given that I no longer took for granted. George's mom reminded me that no matter what is thrown at you, the lesson is simple: life is good. As you know, my father went to work one day when my mom was 29 and never came home again,leaving her a widow with five children, ages 8, 6, 4, 3, and 18 months. A few years later...maybe I was 13?...I asked her, "Mom, if you had known that Daddy would die so young, would you have decided not to have so many kids?" Her response: "OH MY NO! You kids are all I have left of him!" And she meant it. No one ever made me feel such appreciation as she did. We are as strong as we must be.